David Hockney (b. 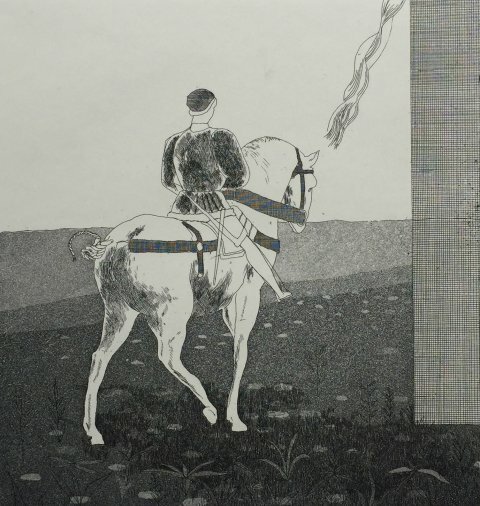 1937) is a prominent British printmaker, painter and designer. He studied at the Bradford School of Art from 1953-57, followed by the Royal College of Art in 1959. It was here that he first turned his hand printmaking, since he was aware that the Royal Academy printmaking department gave free materials out to students, unlike the painters. Hockney soon produced a large and eclectic body of work, engaging with the freedom of the printmaking process and the ability to control the effects of acid on copper in his etchings. From 1961-3, he produced one of his first and perhaps most celebrated set of prints, A Rake’s Progress, consisting of sixteen prints inspired by William Hogarth’s 18th-century version and featuring Hockney’s first trip to America. The Royal College subsequently published the set and persuaded him to enlarge its size. 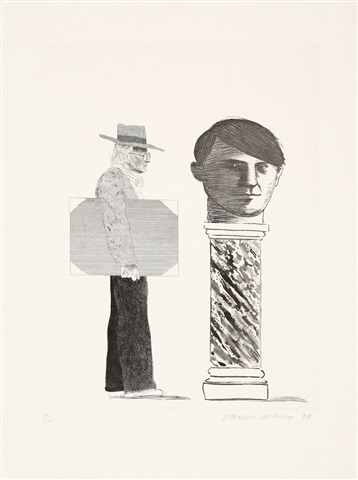 In 1973 Hockney moved to Paris and embarked on a set of prints in homage to Pablo Picasso – an artist he greatly revered but who died in 1973 and did not have the opportunity to meet. These works depict a self-portrait alongside Picasso and he engaged with new methods such as the sugar-lift as seen in The Student: Homage to Picasso. 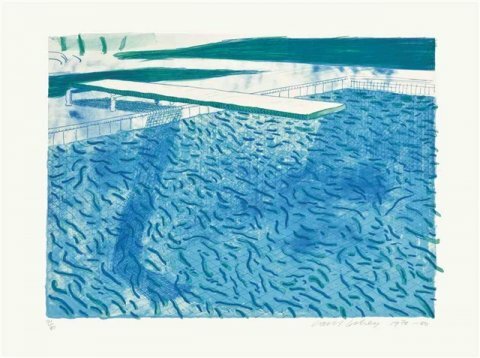 From around 1975 to 1995 Hockney turned his hand to lithography following his first trip to California in 1963 and his involvement with the Tamarind Lithography Workshop where he first engaged with the medium. Swimming pools, palm trees and the vibrancy of colour and sunlight soon entered his subject matter. In his later Moving Focus series (1980s), comprising of 29 large scale scenes including views of the Hotel Acatlán in Mexico, Hockney explored the use of multiple perspectives to recreate the actual process of seeing onto a flat surface and in turn directly involve the viewer. 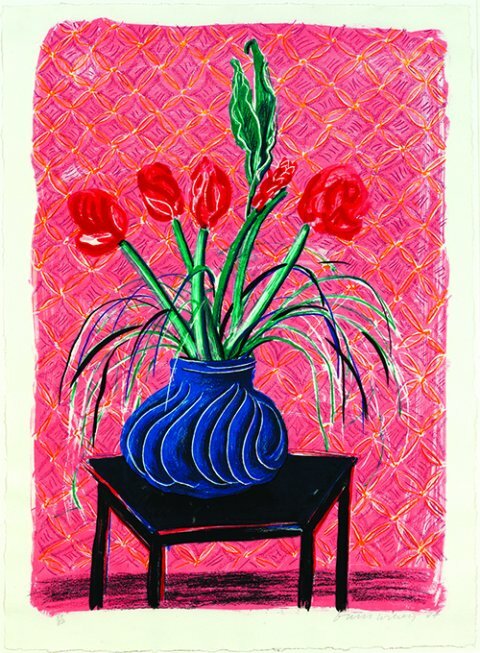 Amaryllis in Vase, 1985, Lithograph. In recent years, Hockney has explored the opportunities that lie open with advancements in new digital technology as he turned from paintbrush to finger in creating his iPad works, subsequently printed onto photo paper. His blockbuster 2012 exhibition A Bigger Exhibition at the Royal Academy showcased his monumental landscape works across different media, followed by his 2016 exhibition in the Sackler Wing, which displays his most recently completed portraits he painted in Los Angeles when he invited many friends and family and artists into his studio. In 2017, the Tate, London, the Centre Pompidou, Paris, and the Metropolitan Museum of Art, New York, hosted major retrospectives of his work. and receive regular updates about our exhibitions, fairs and acquisitions.